Here is a link to the latest newsletter for THREADS. You’ll find information about the national award Surayia Rahman recently received, along with details of how and where you can get your own copy of THREADS, and how you can request it for your local library or your school. We’re so grateful to many people who have helped along this journey, and we hope to have your support as we move to the next phase of this inspiring project: continuing the outreach for the film, bringing it to women and girls around the world and using it to improve the lives of artisans everywhere. Links to past newsletters and to other articles about Surayia Rahman and THREADS is on the film website here. Very best wishes for 2018! Surayia and women of ARSHI. Welcome to the new, updated, kanthathreads.com! Many, many thanks to Elizabeth Hendrix of RippleFLIX for her vision, energy and skill! We appreciate your help more than we can say. And thanks also to the tech staff at Siteground for helping us go live today. Threads is now available for educational institutions, libraries and for community screenings at distributor Collective Eye. For home use (without public performance rights) you can buy a DVD on Amazon.com or stream the film on Vimeo.com. Please help us spread the word, and ask your public library and school to get a copy! We wish everyone a happy and healthy 2016! You can read our end-of-year recap newsletter here. 2015 has been a year filled with activity for Threads, and we look forward to announcing more exciting news soon. Please keep following the list of screenings on our home page and Facebook, and do contact us at info@kanthathreads.com if you or someone you know would like to host a screening of the film. As we noted in the newsletter, we are fundraising to dub the English portions of Threads into Bangla, and to travel to Bangladesh to show the film to a number of audiences, including in the slum where our friends from Spreeha work. Please consider a tax-deductible year-end contribution to these efforts via the International Documentary Association. Thanks to everyone who has helped us so much this year, especially to Lynn Stevenson who designed beautiful posters, flyers, bookmarks and postcards. https://kanthathreads.com/wp-content/uploads/THREADSLogo-1.png 0 0 kanthathreads https://kanthathreads.com/wp-content/uploads/THREADSLogo-1.png kanthathreads2015-12-30 14:20:232015-12-30 14:35:34Happy New Year! Here is the link to the latest newsletter from Threads. As you can see in the newsletter, and from the growing list of laurels on the website homepage, the film is reaching a wider and wider audience. If you know of people or places that should host a screening of this film, please have them contact us or let us know how we can reach them. info@kanthathreads.com. One of our next goals is to dub the English portions of the film into Bangla so that we can show it widely in Bangladesh. We hope to have exciting news soon about when Threads will screen there. Thanks again to everyone who has supported Threads! We could not have come this far without your help. Surayia in a scene from THREADS. Filmed by Mishuk Munier. 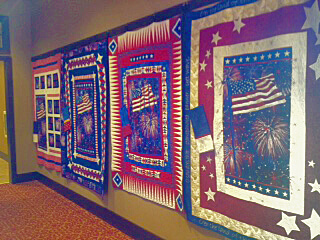 Some of the Quilts of Valor at Jubilee Lodge. Today Americans celebrate Memorial Day, commemorating the sacrifices of those who have died in the service of their country. We were reminded of those sacrifices when we recently screened Threads and had a lively discussion about the film at Jubilee, an active adult community in Lacey, Washington. 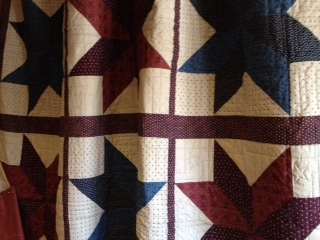 Just outside of the hall where we showed the film was a very moving display of quilts made by residents of Jubilee for wounded service members at nearby Madigan Army Medical Center. 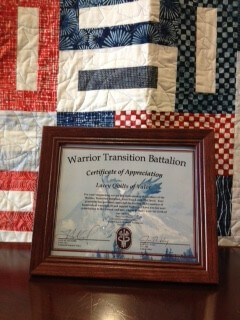 These “Quilts of Valor” demonstrate the skill and dedication of the makers, and received a certificate of appreciation from the Warrior Transition Battalion at the hospital. We brought one of Surayia’s nakshi kantha tapestries, “Gypsy Wharf,” for film attendees to examine. Although “Gypsy Wharf” is very different in style and theme from the Quilts of Valor, the quality and diversity of stitching traditions continues to amaze us. We are always energized by meeting people who, like Surayia and the women of Arshi, turn thread and fabric into visually intricate and wonderful works of art that can warm and help to heal spirit and body. Thank you to those who have served to make us free and to those whose commitment to others gives hope.